I'm constantly startled when someone who follows me here or on FaceBook or Twitter, says to me, "Oh, I didn't know you had a website or wrote books." Really? How can you miss my blatant, self-serving advertising down the right hand column of this blog page? 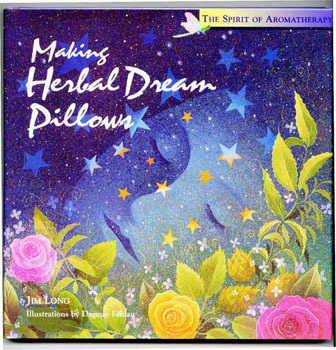 :-) I list some of my books, my Dream Pillows, my famous Herbal Nail Fungus Soak, with links to my web pages along the side of this blog page. But, friends who've asked those questions, have finally convinced me, it's time to tell you more about what I do. So here goes. One view of part of my garden. I garden and collect rare and unusual culinary herbs from my travels in places like Thailand, India, Indonesia, etc. I grow around 200-300 varieties of culinary and medicinal herbs each year, along with many Native American and Asian vegetables, along with 30 varieties of hot peppers, figs, muscadines and lots of other things. Those not only provide the photographs I use for the magazines I write for, but food for our table and inspiration for my books. 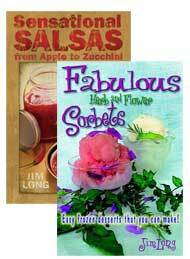 You'll find my books in several seed catalogs including Pinetree Gardens, Richters Herbs, Lehman's, Baker Creek Seed and others. Or you can see them here, on my website, http://www.LongCreekHerbs.com I have 24 books in print with 2 more coming in the next couple of months. 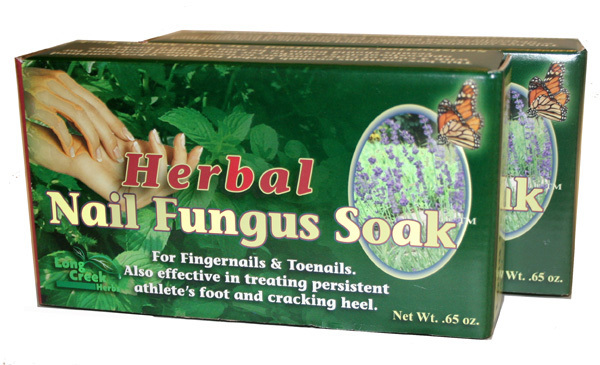 Over the years lots of doctors, pharmacists and even some Veterans Administration podiatrists, recommend my product. It works, I guarantee it! 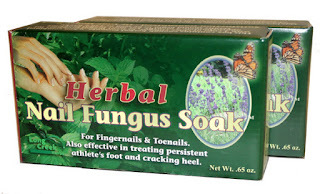 You may see my ads for Nail Fungus Soak in Mother Earth News, Countryside, The Heirloom Gardener and The Ozarks Mountaineer magazines as well as in many state electric magazines and elsewhere. I have 6 other blogs - the links are on the right hand column of this blog. I write for 17 newspapers, as well as The Heirloom Gardener, Missouri Gardening, and The Ozarks Mountaineer, have written for The Herb Companion since 1990, The Herb Quarterly for several years, and do free-lance work for several other magazines. So there you have it, a bit of what I do. For those who already knew, my apologies; for those who asked, I hope this is helpful and that you will visit my website! (There's also a place on my website where you can download photos for your desktop/wallpaper if you wish, and a garden tour, as well). 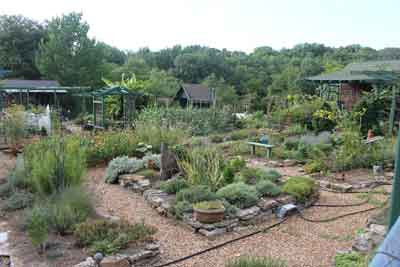 Another view of our garden at Long Creek Herb Farm. I hope if there are any followers or visitors here on my blog from Mississippi you may have heard my interview with Felder Rushing on Mississippi Public Radio on Tuesday. 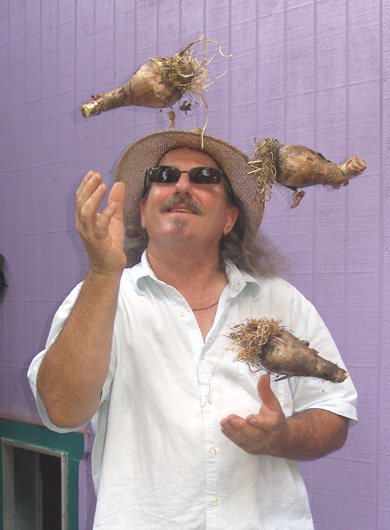 Felder's radio show, the Gestalt Gardener is always both a laugh and informative. Felder is one of the craziest, funnest people I know. He's had me on his show several times and it's always great to hear his off-center take on things. 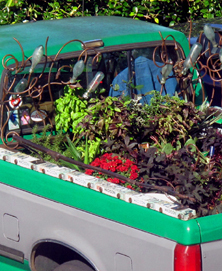 (You may recall I've posted about his Pickup-Truck-Garden on this blog before, demonstrating how he proves you can grow a garden anywhere, even in the bed of a pickup truck). He said he's put over 500,000 miles on his truck since 1988, driving to speaking engagements and book signings. Check out his web page here, you will get a laugh at all the fun and crazy things he does. He believes gardeners shouldn't take themselves too serious. For example, the photo up at the top of him juggling, which he dubbed, "bulbs CAN be fun, don't be intimidated by bulbs." He'll take a subject like bulbs and demystify the planting, but at the same time there he is juggling. I stole the photo off his website, he won't mind. 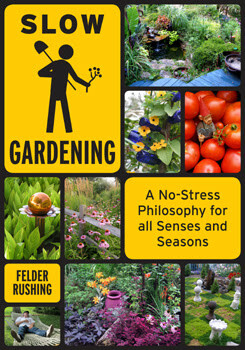 Felder's new book, Slow Gardening. Felder's written lots of books, I don't know how many, but each one is full of quirky, fun and useful information. I've not read Slow Gardening yet but you can find more about it on his website. (You can also find his interpretation of Stonehenge for his own garden after he visited the real Stonehenge for winter solstice a couple of years ago. He is, as they say in the South, a real hoot and it was a pleasure to be on his show again. You can download the podcast, from the Mississippi Public Radio website if you want to hear the interview. Our conversation on the show began with, "Jim, what are doing in the garden this time of year?" And my answer was, "Felder, the goats got out and are in the garden eating the tops off my figs today." 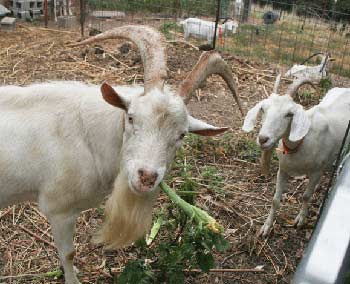 Yes, these very goats got a mention on Felder's show. Grrrrr. If you receive my newsletter you already have my favorite chili recipe but if you don't, here it is, below. 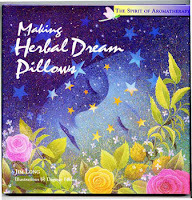 (If you would like to be on my email newsletter list, go to www.LongCreekHerbs.com and email billie@longcreekherbs.com and let us know you'd like to receive our newsletters). Optional: add 1/3 cup diced sweet bell pepper and 1/2 cup sliced, fresh mushrooms in last 10 minutes of cooking. 1 - Brown ground beef and ground turkey in a small amount of vegetable oil. 2 - Add the onions and Chili Powder and continue cooking until onions are tender. about 2 cups of water. Continue simmering for about 20 minutes, then serve. (To make a thicker chili, I often use a potato masher and mash the beans some before serving). 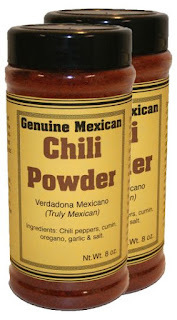 I think our special blend of chili seasoning that we sell is the best you can get anywhere. This week I checked at the grocery store and saw that 2 oz. of chili seasoning costs about $4. If you order ours, you get 8 ounces (that's half a pound) for only $6.95 and it's better than the store-bought, in my opinion. We make lots of chili in the winter here and if you do, too, our Chili Powder is on sale, $6.95 for 8 ounces, or a full pound for just $12, (plus shipping) if you mention you saw it here on my blog. Order here. It's not hot, but very, very tasty! Happy Thanksgiving weekend, don't eat too much. If you make Herb Crafts, Teas, Dream Pillows or Herb Gifts for the Holidays, we're having a ONE-TIME-ONLY-SALE of our top quality organic bulk herbs. Great bargains on things like Greek and Italian Seasoning, cinnamon sticks, whole cloves, Cajun Spice, and more. When we sell out of the quantities listed, they'll gone and we won't be restocking. These are fresh, organic, non-GMO herbs and spices. They make good Holiday gifts, too! Kids gardening is important! When kids learn how to grow plants, learn where their food comes from and how to prepare healthy meals, they learn skills that will stay with them for their entire life. 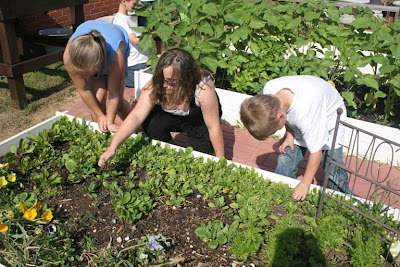 I've written about the amazing kids' garden project at the magnet school in Jonesboro, Arkansas, several times before. (Click here to see an earlier post and more photos). But I thought you might like a reminder that this project is always struggling to find enough money for seed, soil and other supplies the kids need. Learning to weed and identify the edible plants. Buy Seeds - Help Children! button on left side of our home page. The lower left corner on our home page has the Buy Seeds - Help Children button. When you click on that, you are directed to a page with a code to enter when you place your order at Renee's Garden Seed You can order seed for your spring garden, (or even for Holiday gifts!) and if you order now, your order will count toward a donation for the kids' garden project if you do it before the end of the year. 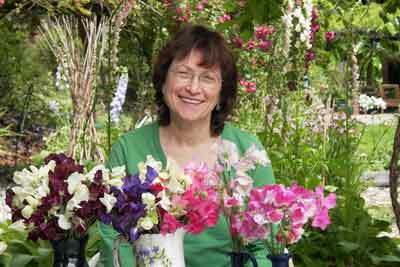 Renee Shepherd donates to a wide variety of children's garden projects, both in the United States and in other countries. 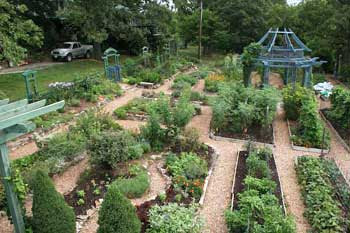 That's why we are so pleased to partner with her in helping this garden in Jonesboro, Arkansas. If you have not visited her website, please do so, her seed selections are outstanding. Maybe you have read my profile of her in the current issue of The Heirloom Gardener, which tells more about her generosity and seed selections. (If you would like to know more about The Heirloom Gardener magazine, click here, or look for it in Whole Foods stores, Barnes and Noble, etc. 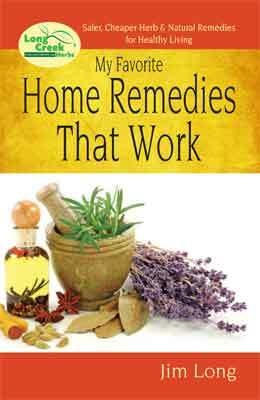 I've been a regular columnist for the magazine for the past 4 years; look for my Heirloom Herbalist columns). To visit Renee's Garden website, go to our website at Long Creek Herbs, and click on the Buy Seeds - Help Kids! link. You will see a link to Renee's Seeds website, look around and see if you aren't tempted by her spring seed offerings. Then when you order, use our code, which you'll see provided, so that she can make a donation to this wonderful project! 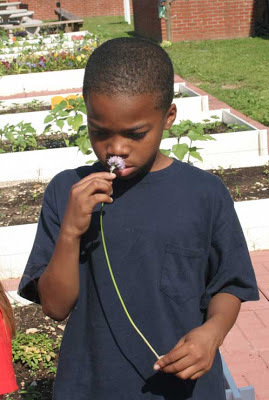 Then, you will know that more kids, like this boy, below, can experience for the first time in their life, the taste and smell of a chive blossom and learn how to fix a meal using fresh herbs and vegetables right out of the garden. His first time, ever, to smell and taste a chive blossom! If you make Herb Crafts, Teas, Dream Pillows or Herb Gifts for the Holidays, we're having a ONE-TIME-ONLY-SALE of our top quality organic bulk herbs. Great bargains on things like Greek and Italian Seasoning, cinnamon sticks, whole cloves, Cajun Spice, and more. When we sell out of the quantities listed, they'll gone and we won't be restocking. Even though the garden has slowed down, we haven't had a killing freeze yet. There is still lettuce and radishes in the garden, lots of kale and mustard greens, too. But I thought you might like to see some scenes from around Long Creek Herb Farm. 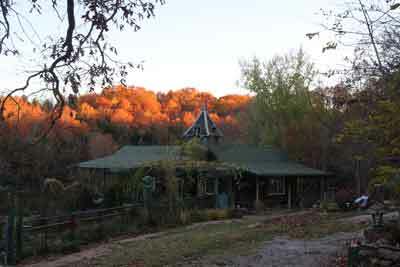 The Herb Shop today in late afternoon sunlight. I know this may look much like a photo I posted a couple of weeks ago, but this is from today, Nov. 7. 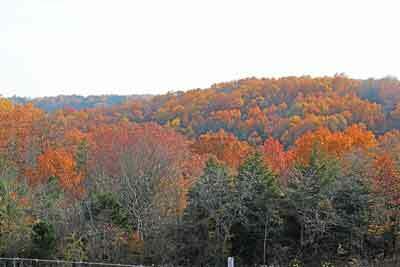 I thought our fall colors had finished, but instead, we have the best colors now that we've had anytime in recent years. 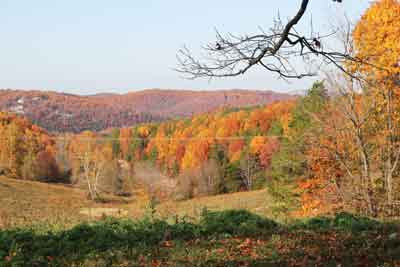 Look at this, the maple trees in front of the house. Native sugar maple with a red maple in the background. The odd-looking object hanging on the right side of the photo is a wind chime friends gave us some years back. 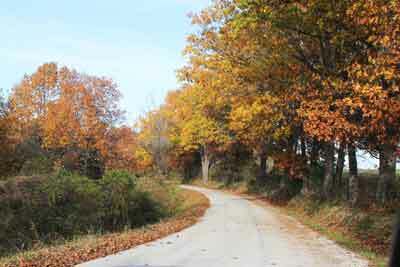 The road leading to Long Creek Herbs, with lots of colors. Hillside right before the farm. 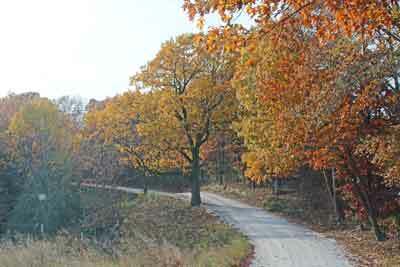 Along the road to the farm with lots of hickory and oak trees. The valley just over the hill from our farm. You can't quite see the lake (Table Rock Lake) but it's just beyond the line of trees. 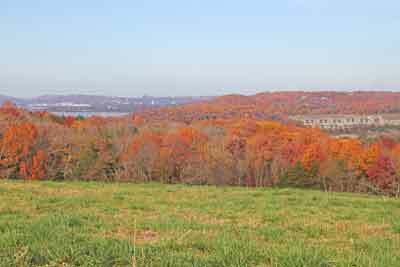 This is the hillside just above the farm, which is out of view because of the trees. This is taken from a high hill just above the farm. If you can see the line of condos on the right side, that is across Long Creek cove from us. In the upper left you can see more of Table Rock Lake in the distance. 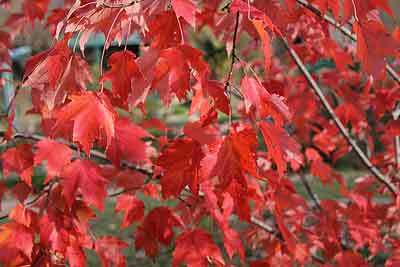 Red maple leaves in our front yard. 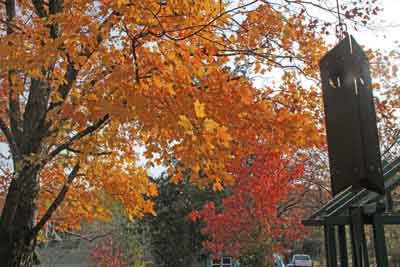 It's exciting to me to have so much fall color when I thought fall was over and done with. Instead this week is the best we've had yet and I just had to share it with you. If you make Herb Crafts, Teas, Dream Pillows or Herb Gifts for the Holidays, we're having a ONE-TIME-ONLY-SALE of our top quality organic bulk herbs. 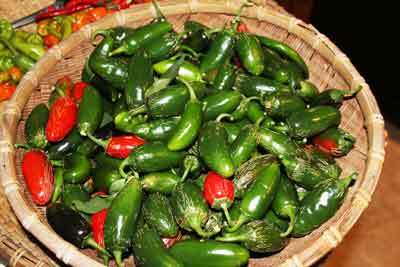 Fresh jalapeno peppers, ready for canning. I'm making great progress on my new hot sauce book. I've discovered something surprising while having friends taste-test my hot sauce recipes. About a third of the people I know, don't know the difference between hot sauce and salsa. I'm amazed! To me it's like comparing cauliflower and broccoli, two distinctly different things. I have decided to include an extra paragraph in the hot sauce book, explaining that hot sauce is a condiment you use by the drop to season food - such as on eggs, in soup, etc. Salsa, by contrast, is for dipping. You eat it with chips but you would never eat hot sauce that way. I decided to add 4 or 5 recipes at the very end of the book under the category of "Hot But Not Sauced." 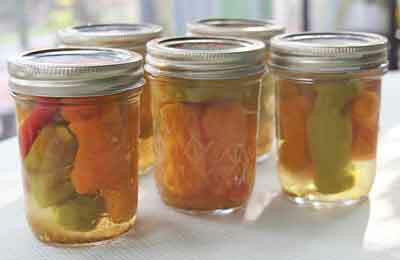 It includes habanero-peach jelly, pickled peppers and my recipe for candied jalapenos. If you haven't tasted candied jalapenos, and you like moderately hot things, these are a treat. On a hamburger, or tuna salad sandwich, or, as I like them, as a topping on ice cream! They have very little heat, mellowed by the sugar, but the taste is excellent. See what you think. Candied Jalapeno peppers are outstanding on vanilla ice cream! 2 - Combine vinegar, sugar and salt in a saucepan. Bring to a boil and boil hard for 6 minutes, or until the syrup begins to thicken slightly. 3 - Add the pepper slices and cook for 2 minutes. 4 - Remove mixture from heat, discard cinnamon stick and spoon pepper rounds into sterile half-pint jelly jars and fill with the hot syrup. Add 1/8 teaspoon Pickle Crisp to each jar. Wipe jar rims with damp paper towel. Attach lids and store in the refrigerator where they keep for months. (You could also can these using the water bath method, 10 minutes, which is what I chose to do). The recipe makes 4 half-pint jars. *Note: I use 1/8 teaspoon Pickle Crisp added to each jar before sealing to make a slightly crisper pickle. 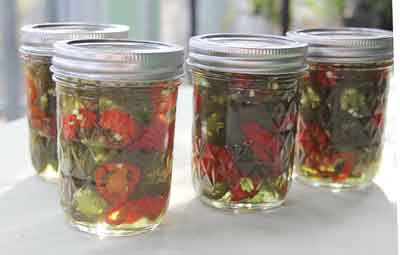 I also use it when I make pickled peppers, like these below.